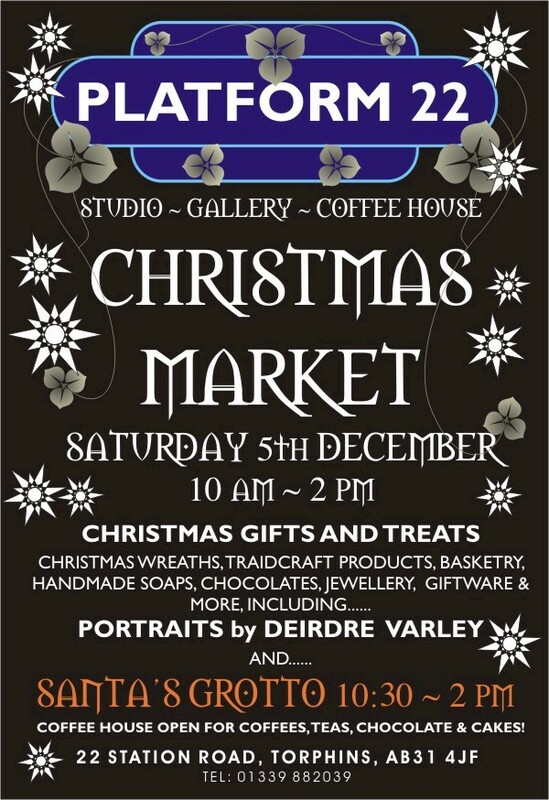 On Saturday 5th December 10am to 2pm we are holding our second Christmas Market. Outside the gallery in the courtyard we have a great mix of stalls selling everything from Christmas wreaths, handmade soaps and chocolates to basketry, art prints and calendars. 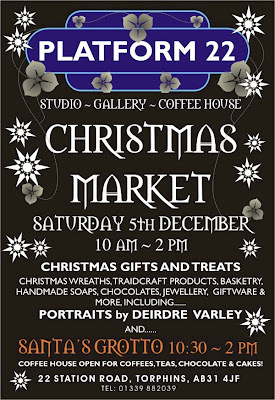 Additionally there will be a Traidcraft stall and the opportunity to have a quick (5 minute) portrait by local artist Deirdre Varley or a relaxing massage by Anna Rochester. Torphins Primary School's PTA will be magically transforming Emma's studio into a "winter grotto" for the arrival of a special guest, Santa! He is of course a VERY busy man just now and we are thrilled he is coming to join us between 10:30 am and 2 pm along with his happy helper elves! In the gallery our Christmas Exhibition is showcaseing work by wildlife artist George Perkynson, wood work by Duncan Andrew and Robert Paterson, jewellery by Pip Will, wire work by Sandra Gorrora, glassware by Scandiscot and ceramics by Crazy Chix and Emma Pattullo. Fingers crossed for good weather! However, just in case it might be cold we will be serving warming mulled apple cup to keep you warm while you check out the goodies on offer. Platform 22 also has a new cinnamon flavour of our popular Choc-o-Lait hot chocolate and this will be available, along with the usual teas and coffees, from the coffee house.